A Good Cut Diamond has good proportions and light reflection though with imperfections visible only to the trained eye. A Good Cut Diamond has rare brilliance and range of proportions making it a truly perfect diamond for almost any diamond jewelry setting. E Color Diamonds are known as either 'colorless' or 'exceptionally white'. These diamonds are truly some of the most fluorescence diamonds available from diamond retailers. The rarity of the E diamond ensures a great investment. Small Inclusions 2. 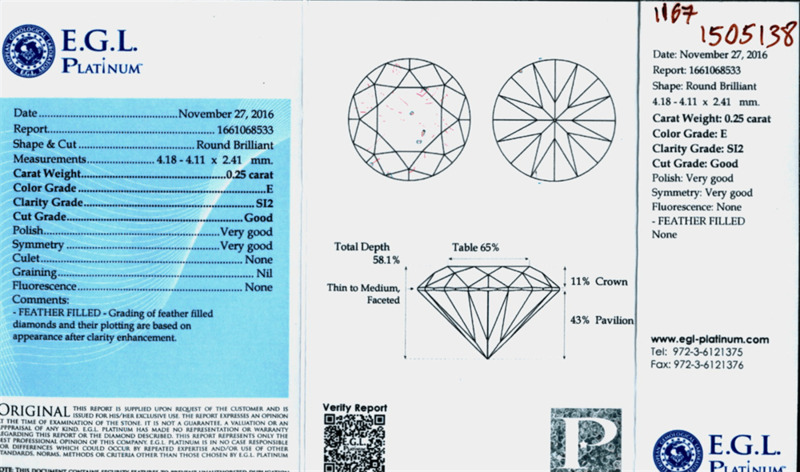 SI2 diamonds will have a number of small flaws (inclusions), identifiable by a trained observer using a x10 magnification. There are cases that SI2 is visible to the naked eye. SI2 diamonds remain highly popular due to their fantastic shine and great value for money. "..I would highly recommend others to invest via your company"-A.Redgrave, UK"